How are you doing, friend? Today I’m sharing my method for only prepping 5 ingredients that will make amazing (& FILLING) lunches for your whole week. Your co-workers, friends, or dog (if you work from home) will be impressed and envious of your nutritious goodness. I’m going to admit something... I used to be SO resistant to meal prepping. For the longest time I didn’t want to commit any time to cooking other than the immediate meal ahead of me. I was afraid I’d get tired of the same ingredients and that I would make the same meals over and over. I also just had this unnecessary rebellion against it, for whatever reason. Looking back, it seems so silly! Now, I really like prepping at least a FEW ingredients that will help make the week run smoother and I won’t have to spend too much time in the kitchen figuring out lunch each day. **An optional prep addition which I think enhances any lunch during the week is onions & peppers. Preheat the oven to 400°F and prep a few baking sheets by coating lightly with oil. Then, dump chopped butternut squash on one pan. I have to admit I cheat and buy the pre-chopped squash (or sweet potato, depending on what starchy veg I’m feeling that week). The slightly higher price is worth the time save for me. I really wrestle with squash, I haven't found the right knife yet to make cutting them easy or enjoyable. You could totally cube your own from a whole squash, though! Then, drain and thoroughly wash a can of chickpeas. Dry them off and then coat with olive oil, salt, & pepper. Lay them out onto half of another sheet pan but leave room for some veggie neighbors to bake alongside. *Optional After that, slice a whole onion into thin strips as well as a bell pepper (I love the sweeter yellow or orange ones!). Place the onion strips alongside the chickpeas; drizzle with a little more olive oil and then sprinkle with salt & pepper. By this time the oven should be preheated, so throw both sheet pans in the oven and set a timer for 30 minutes on the oven or microwave. I like to also set a timer for 15 minutes on my phone to remind me to turn over all the ingredients halfway through their cook time. Then, measure a cup of quinoa and 2 cups of water in a large saucepan. Follow the directions and let that be cooking while chopping the other ingredients that don’t need to be cooked. While the quinoa is cooking on the stove & the sheet pans are roasting in the oven, chop the celery into small bites for topping salads and slice yellow cherry tomatoes (they’re not as acidic as red ones). It actually takes a little time to thoroughly wash & cut the celery – they’re surprisingly dirty, and I like to make sure I’m cutting up only the best parts of the whole stalk. By the time you wash and chop the celery and cherry tomatoes, it’s time to check on the quinoa (which may be done cooking) and turn the ingredients on the sheet pan. I like to load my prepped vegetables in glass storage containers and pop them into the fridge. I then let the quinoa cool down to room temp before storing it in the fridge. By the time you’ve cleaned up your chopping board, knife, and leftover food scraps from chopping, the ingredients in the oven will be done and you can pull them out for cooling and storing. I love layering these ingredients onto a bed of spinach or massaged kale topped with your favorite healthy dressing for a quick, healthy lunch! You could also throw any combo of these in a skillet with a few beaten eggs to create a healthy, protein-packed scramble. If you’re craving something extra filling and you’ve had your green smoothie for breakfast, then throw the quinoa, squash, and tomatoes in a glass container, top with cheese (my favorites are goat or feta! ), then microwave a few seconds before eating. I love to top with hot sauce! 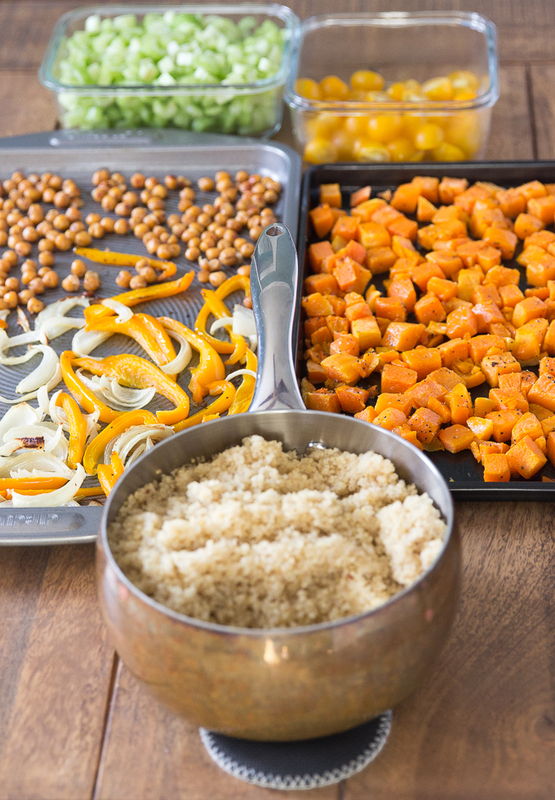 By taking a few minutes to prep these 5-ingredients, you can look forward to a healthy variety of ingredients to create filling and yummy lunches all week! Do you meal prep right now? What are your favorite ingredients or tips on prepping? Comment below and let me know! Here’s to great, healthy lunches with minimal prep time… Cheers!